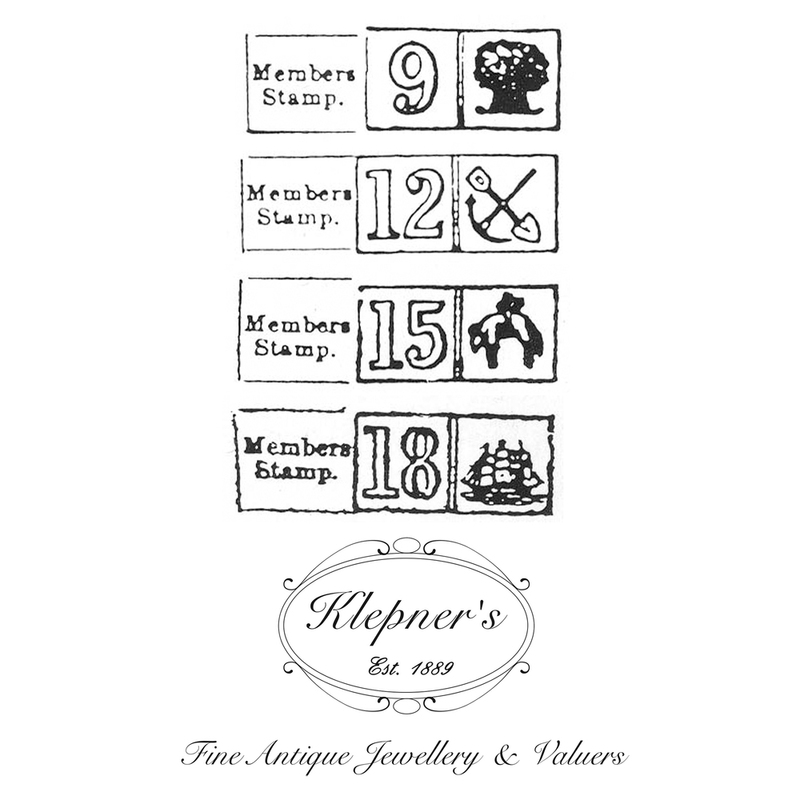 In 1889, the same year as Klepner’s was founded, the Melbourne Manufacturing Jewellers Association decided to introduce what in effect was a compliance plate for jewellery the guarantee of quantity mark. The stamp had three squares: the first had the makers punch, the second had a 9 or 12 or 15 or 18 which represented the caratage of the piece and the last had a symbol which represented the caratage stamp. 9ct-wheat bundle, 12 carat-pick and shovel, 15ct-a hanging sheep and 18ct-a sailing ship. The four symbols for the caratages came from the four quadrants of the Advance Australia coat of arms which was the forerunner of the Australian coat of arms after Federation in 1901. The beauty of finding these stamps on a piece of jewellery is that it gives the collector a definite window of when the item was made 1889-1920. Aronson & Co, (a flag), Benjamin &Sons (bee) Davis (lion’s head), Duggin. Shappere & Co (anchor), Larard Bros (5 pointed star above a heraldic bar), Johnson & Simonsen (compass and set square) Parker (a bell).